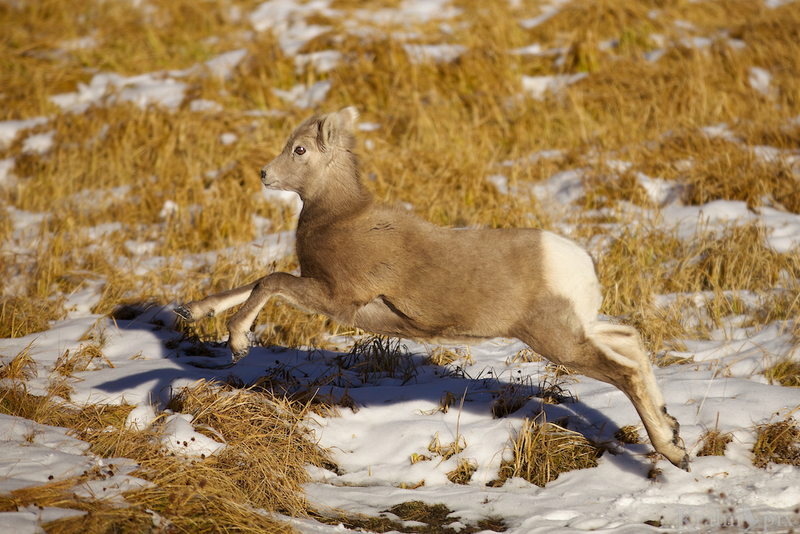 You would never know this Rocky Mountain Sheep is standing on the road … unless I happened to mention it. Some animals only come out at night. Some are camouflaged so well you don’t see them. Some never show themselves to humans. And then there are Rocky Mountain Sheep that often park themselves in the middle of the road and lick up the salt. They’re a little harder to miss. I’m all for co-operative wildlife, it’s just a little hard to come up with a believable story of marching through the jungle for days to find one when the photo clearly shows them standing on a dotted line! Don’t get me wrong, I think they are fantastic creatures. I have spent hours watching them and have enjoyed the entire time. It’s just that I’m generally not a fan of the road in the photo so that leaves me trying to take head shots. On my last trip to the Rockies, I finally found them … parked on the road again. I was standing off a ways and the sheep were completely unfazed by my presence – all of them expect one youngster. It would rush off behind a nearby bush, peek out the other side, then decide it was OK to return to mom, then run off again. Meanwhile the mom kept right on licking salt. The little guy kept peeking out from behind the tree to check me out. I enjoyed watching the little one run back and forth. This was far more interesting than the adults and besides … I’ve heard that too much salt isn’t good for you. I was happy to catch the little sheep in mid stride. It’s always interesting to learn the back story of a series of photos. I have zero knowledge about these kind of sheep (and little knowledge of sheep in general). You could have told me these were shots of a goat and I would have believed you. I was going to tell you which image I liked most, but I really can’t make up my mind. A portrait, an environmental shot, and an action shot–even an Olympic judge would have trouble trouble deciding. They can all share the gold medal and the podium. I appreciate the Olympic references and the judging! I also enjoy the back story of other people’s photos so I tend two write what I like and hope it connects. Thanks for the comments. Happy to help with that. Glad you liked it. It was a fun afternoon to remember. That sheep is so cute! At least he cooperated and gave you some good non-road photos. It certainly is. I thanked the sheep profusely at the end of our session! I sooo love that little guy…well done!! He’s a cute one and so much fun to watch. Thanks. Coy little devils, aren’t they? Love the midair shot. Just out of curiousity, Lyle, how many pictures would you have taken overall? Glad you like it. I went back and counted about 350 photos – of course that includes everything so there are a lot of repeats and poor ones as well. Figured the number would be impressive. Takes a lot of work to make something look like it comes so naturally. Before I took photography more seriously, I showed a commercial photographer around a worksite so he could take photos. Even after getting the light perfect, he still took a surprisingly large number of shots. I decided then if a paid pro doesn’t expect to get it all in a few shots, why am I trying to be a hero? After that I I consistently took lots of shots which can sometimes be a drag when I’m processing them later but it certainly increases the odds especially with unpredictable wildlife. Certainly helps to stack the odds in your favour. That’s what 32Gb memory cards are for, right? Absolutely and on a really good day, that fills up. I love the composition in the second shot and of corse your capturing the sheep while leaping in such a sweet light, with a nice catchlight in the eye and the pleasing shadow behind it is just priceless. Excellent work as always. Thanks. It’s nice when the shots come together and you nicely described all the key points I noticed. Love these guys! Excellent mid leap capture of the youngster! I wonder if they would prefer chips or pretzels in the heavily salted snack department? They do have a certain appeal. I’m thinking chips. This reminds me of a hike in Yellowstone once. We were hiking along the edge of the Yellowstone River and had been looking for bighorn sheep along the canyon walls for hours, spotting nothing. We stopped to get out the binoculars and my husband suddenly laughed and told me to look. I looked everywhere, still couldn’t find anything, then lowered the binoculars to see an entire herd of mother sheep and their young sitting in the grass not 20 feet away, staring at us. In our defense, they really do camouflage well! That’s a great story. We can never be sure we’re looking in the right places. And it makes me wonder how many close encounters I’ve had with camouflaged snakes. Probably better not to know! I’m sure they all had a good laugh about that. Thanks. I bet they do too which is why they are after it so much. I wonder where they got it before the roads came through the area. Thanks. That’s certainly true and forces us to be creative sometimes to work around that. With their beauty comes danger. Like in all things, right? Yes the road isn’t the safest place for them to hang out. I have the same problem with caribou on the highway here in Watson Lake in winter. Fortunately, they do leave the highway when a vehicle approaches so I can get some shots without a highway in it. But most of the scenes are caribou bunched together with their heads down and butts pointing in my direction. Yes there are only so many shots like that before you’re looking for some variety. I hadn’t expected that problem with caribou since the photos are usually on vast open spaces but then I don’t think I’ve seen a caribou in the wild. I just had the same problem with a herd of elk. They were grazing out in a marsh, but it was still all butts pointed toward me except for one guy giving me the stink eye!